what a fun process put together by the reverb10 team! it's been an enjoyable journey and i'm grateful for the chance to reflect based on the oh-so-creative prompts. below are my remaining reflections. did you participate? if so, please share your favorite Q+A. and december 21 on future self. A: oodles of book tour plus leading retreats in costa rica, india and kripalu comprised most of my travel. in addition i headed to kripalu for 2 workshops as a participant, a mexico art journal retreat, and time with family in oklahOMa. in 2011 i hope to travel to sydney, tokyo, and paris along with another art retreat. A: coco or lou lou because it sounds tres french and chic! December 24 Prompt – Everything’s OK What was the best moment that could serve as proof that everything is going to be alright? And how will you incorporate that discovery into the year ahead? A: when i returned to the yoga mat this year after my first surgery, i felt a surge of happiness and gratitude throughout my entire body. it was a sign that all would heal and that i would be able to return home to being in my body. felt amazing and overwhelming - like coming hOMe! 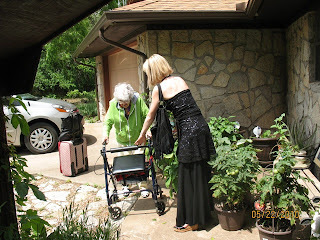 A: here i am with my beloved gramma in may heading into my parent's hOMe in the country. she's just recovered from her 3rd bout of pneumonia in 2 years and remains my hero. this picture shows my luggage still by the car and an effort to help my beloved 98-year-old safely navigate the plants and cobblestones with her walker. all while dolled up in TranquiliT palazzo pants, black patent wedges, and a vintage dress worn as a tunic. i long to be of service to others - and strive to do it in style! A: one spring weekend while I was working away on a paper for school, le beau said to me, "if you study hard, i'll take you to the olive garden tonight." i looked up with glee and responded, "that's the nicest thing you've ever said to me!" it became a joke between us but i have to say that my dining experiences at the olive garden with le beau are total highlights. amusement, simplicity, and met expectations. A: meeting walter at the pig sanctuary. who would have known that coming across a pig who loved pearls would touch my spirit so deeply? i'm in love! December 28 – Achieve What’s the thing you most want to achieve next year? How do you imagine you’ll feel when you get it? Free? Happy? Complete? Blissful? Write that feeling down. Then, brainstorm 10 things you can do, or 10 new thoughts you can think, in order to experience that feeling today. A: a deeper connection to mindfulness in my daily life. it will be an ongoing effort and i don't know that i'll ever fully "get it." deeper mindfulness today can be "achieved" via: journal writing, slowing down, eating slowly, being fully present in each moment, meditation, listen to music, connect with breath, do yoga, observe thoughts, sip tea. A: the january art journal retreat launched 2010 with a creative spark. my surgeries reconnected me with my body and the healing journey in a new way. book tours connected me with an amazing community of like-minded ladies. taking on an internship that has challenged and rewarded me in numerous ways. A: the gift of healing. hands down. oh, and my kindle! December 31 – Core Story What central story is at the core of you, and how do you share it with the world? A: i want to make a difference in the lives of animals, spread inspiration, and challenge myself on a daily basis. i share this story via my blog, podcast, organizations, vlog, and volunteer efforts. big hugs to you Kimberly & happy new year!